This study investigated the influence of 2-months ingestion of an "immune" nutrient fortified breakfast cereal on immune function and upper respiratory tract infection (URTI) in healthy children during the winter season. Subjects included 73 children (N = 42 males, N = 31 females) ranging in age from 7 to 13 years (mean ± SD age, 9.9 ± 1.7 years), and 65 completed all phases of the study. Subjects were randomized to one of three groups--low, moderate, or high fortification--with breakfast cereals administered in double blinded fashion. The "medium" fortified cereal contained B-complex vitamins, vitamins A and C, iron, zinc, and calcium, with the addition of vitamin E and higher amounts of vitamins A and C, and zinc in the "high" group. 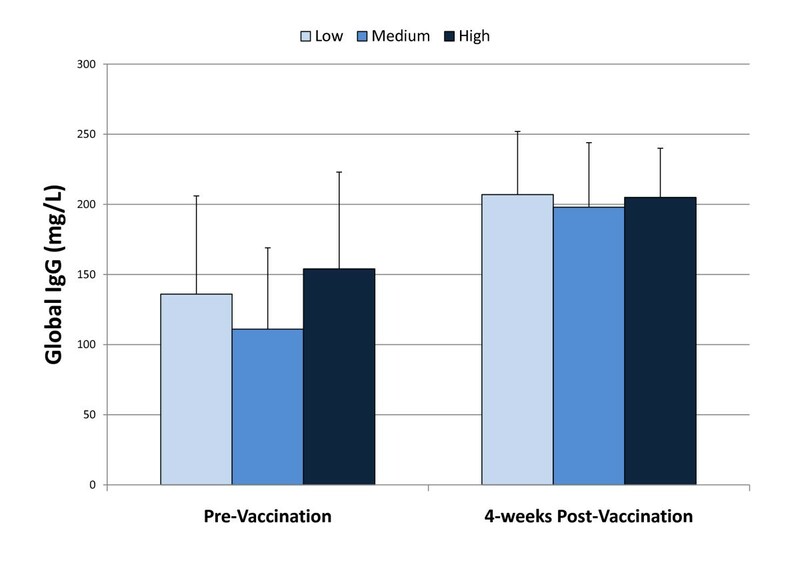 Immune measures included delayed-typed hypersensitivity, global IgG antibody response over four weeks to pneumococcal vaccination, salivary IgA concentration, natural killer cell activity, and granulocyte phagocytosis and oxidative burst activity. Subjects under parental supervision filled in a daily log using URTI symptoms codes. Subjects ingested 3337 ± 851 g cereal during the 2-month study, which represented 14% of total diet energy intake and 20-85% of selected vitamins and minerals. Despite significant increases in nutrient intake, URTI rates and pre- to- post-study changes in all immune function measures did not differ between groups. Data from this study indicate that ingestion of breakfast cereal fortified with a micronutrient blend for two winter months by healthy, growing children does not significantly influence biomarkers for immune function or URTI rates. Nutrients are involved in the immune response to pathogens, facilitating cell division and the production of specific antibodies and cytokines, and in providing metabolic support for skin and mucosa physical barriers . Enzymes in immune cells require the presence of micronutrients, and critical roles have been defined for nearly all nutrients, including zinc, iron, copper, selenium, and vitamins A, C, E, D, and B6 [2, 3]. One of the earliest interactions between nutrition, immunity, and infection was established in malnourished children [4, 5]. Nutritional deficiencies and immune dysfunction, with improvements measured following immunonutrition support, have been linked in several other groups including the frail elderly, patients experiencing surgery, illness, and trauma, and human immunodeficiency virus (HIV) infected individuals [6–13]. Less clear is the immune-related benefit of nutrient supplementation among healthy children and adults with no overt signs of immune system deficiencies. Among free-living adults, a wide variance in self-selected diet intake is compatible with normal immune function [14–16]. High compared to low self-selected intake of vitamins through diet or supplements by adults is not associated with altered risk of pneumonia [17, 18]. Although data are limited, mixed or single micronutrient supplementation among healthy, community-dwelling adults is largely ineffective in altering innate or adaptive immune function, or in lowering respiratory infection rates [19–24]. Zinc, iron, and/or vitamin A, C, and E supplementation in young, malnourished or diseased children in developing countries reduces respiratory infection morbidity and helps counter impaired immunity [25–31]. The influence of mixed micronutrient supplementation on immune function and incidence of upper respiratory tract infections (URTI) in healthy children is largely unstudied . Children suffer from a high rate of URTI, and the physiologic stress of rapid growth and suboptimal dietary quality may provide room for immune benefit through micronutrient supplementation . We hypothesized that school-aged children would experience improvements in innate and adaptive immune function and a reduction in URTI during two winter months of supplementation with a mixture of immune-related micronutrients administered through a fortified breakfast cereal. Seventy-three children (42 boys and 31 girls) ranging in age from 7 to 13 years, and in body mass index from 13 to 36 kg/m2, were recruited from local elementary schools and home school programs. Inducements included subject stipends and free results of fitness, body composition, and immune function tests. This study was conducted according to the guidelines laid down in the Declaration of Helsinki and all procedures involving human subjects/patients were approved by the university's Institutional Review Board for Human Studies. Written informed consent was obtained from all subjects and a parent. A parent for each child attended all orientation and test sessions, and assumed responsibility for home feeding, dietary recording, health logs, and transportation of their children to the laboratory. Triceps and subscapular skinfolds were measured in each child and summed using the procedures of Lohman et al. . The skinfolds were measured by one trained technician using a Lange skinfold caliper (Cambridge Scientific Industries, Cambridge, MA). Subjects were tested for immune function pre-study, and then again two months later following a regimen of micronutrient supplementation through ingestion of a fortified breakfast cereal. The subjects used a daily health log to record symptoms of sickness using number codes. A pneumococcal vaccine was administered halfway through the study, with the antibody response measured one month later (post-study). Subjects were randomized to one of three groups--low, medium, or high fortification--with breakfast cereals administered in double blinded fashion. Extruded, expanded, puffed corn cereal products with selected micronutrient blends were supplied by General Mills in coded boxes (Minneapolis, MN). For all groups, each 100 g cereal provided 400 kilocalories, 6.7 g protein, 86.7 g carbohydrate, 1.7 g fat, 3.3 g dietary fiber, 133 mg potassium, and 900 mg sodium. The "low" fortification group received the following nutrients per 100 g cereal: 0.8 mg vitamin C, 133 mg calcium, and 0.6 mg iron. The calcium provided in the low fortification cereal ensured that subjects received partial support for growing bones. The "medium" fortification group received the following nutrients per 100 g cereal: 1.3 mg thiamin, 1.4 mg riboflavin, 16.7 mg niacin, 1.7 mg vitamin B6, 5.0 μg vitamin B12, 20.0 mg vitamin C, 1,667 IU vitamin A, 667 μg folate, 500 mg calcium, 27.0 mg iron, and 12.5 mg zinc. The "high" fortification group received the same amount of nutrients as the "medium" group, with higher amounts of the following nutrients per 100 g cereal: 100 mg vitamin C, 8,333 IU vitamin A, 18.5 mg vitamin E (α-tocopherol equivalents), and 25.0 mg zinc. If 100 g cereal were consumed per day, the "high" fortification cereal would have provided approximately 50% of the U.S. Daily Value. Subjects were given two coded boxes for each week of the study, with instructions to consume two to three measured cups (~50-70 g) per day (anytime of the day) for two months. Intake was recorded in daily logs by the subjects/parents, and all unconsumed cereal was returned to investigators for weighing to determine actual intake. To remain in the study, subjects had to consume a minimum of 1,700 g cereal during the study period. Subjects (with parental supervision) were instructed to avoid all other forms of nutrient supplements during the 2-month study. Diet intake was estimated through 3-day food records pre-study, and then again after one and two months. The study dietitian provided detailed instructions using food models and volume measuring supplies to subjects and parents regarding methods for recording volume and portion size in the 3-day food records, and then entered the information into a computerized dietary analysis system, Food Processor Plus (ESHA Research, Salem, Oregon). Children and parents reported to the testing facility between the hours of 7:30-9:30 am having avoided energy intake for the previous 9 h. A 4-min timed saliva sample was first collected followed by a blood sample drawn by trained pediatric phlebotomists. A delayed-type hypersensitivity (DTH) skin test was administered using the Mantoux method with three antigens (Candida albicans, mumps antigen, and tetanus toxoid). Each subject reported back to the testing lab two days later for a 48-h measure of skin induration. One month later, subjects returned to the testing lab, and were given a pneumococcal vaccination by medical personnel. At the end of the two-month period, saliva and blood samples were again collected, and the DTH skin test readministered. All blood samples were obtained from an antecubital vein from the children while in the supine position after having rested for more than 15 min. Routine complete blood counts were performed by a clinical hematology laboratory (Lab Corp, Burlington, NC), and provided leukocyte subset counts. The phagocytosis assay utilized a FITC-labeled bacteria (Staphylococcus aureus; Molecular Probes, Eugene, OR) to quantify the degree of phagocytosis by granulocytes, as described in a previous publication . Briefly, to determine the extent of oxidative burst exhibited by granulocytes, we employed 2',7'-dichlorodihydrofluorescein diacetate (DCF-DA; Molecular Probes), a non-fluorescent molecule which is oxidized to green fluorescent dichlorofluorescein (DCF) as oxygen radicals are generated in the oxidative burst to kill unlabeled Staphylococcus aureus. The white blood cell count was acquired using the Becton Dickinson Unopet manual counting protocol. Using two-color flow cytometric immunophenotying (CD45-FITC/CD13,14-PE), the granulocyte percentage was determined. Bioparticle reagents of unlabeled and labeled Staphylococcus aureus were suspended into PBS at a working concentration of 3 × 105 bioparticles/μl. After determining the number of phagocytic cells in 100 μl of whole blood, and adding 15 FITC-labeled bacteria per cell, the mean channel fluorescence (FITC) was analyzed to determine the degree of engulfed bacteria (non-phagocytized bacteria were quenched with ethidium bromide; final concentration of 200 μM). To determine the oxidative burst activities, either DCF-DA (final concentration, 100 μM) (basal activity level), or DCF-DA and unlabeled bacteria (stimulated activity level) were added to 100 μl whole blood. After incubating the samples for 60 min (37°C) in the dark, lysing the RBC, centrifuging, and resuspending the pellets, the samples (10,000 phagocytes) were acquired on the flow cytometer. Unstimulated saliva was collected for four min into 5 mL plastic, sterilized vials. Participants were urged to pass as much saliva as possible into the vials during the 4-min timed session. Saliva volume was measured to the nearest 0.1 mL, and then frozen at -80°C until analysis. Salivary IgA was measured by enzyme linked immunosorbent assay (34). The data were expressed as concentration of sIgA (μg . mL-1), concentration of sIgA relative to total protein concentration (μg . mg-1), and salivary immunoglobulin secretion rate (μg . min-1). The DTH skin response was assessed with use of three antigens, Candida albicans, mumps antigen, and tetanus toxoid (diluted 5:1), by the Mantoux method with needle and syringe (Allermed Laboratories, Inc., San Diego, CA; Aventis Pasteur, Swiftwater, PA). The volar surfaces of the left and right arms were cleansed and labeled (mumps antigen and tetanus toxoid on the left arm, Candida albicans on the right). At each site, a needle was inserted into the skin at a 45 degree angle to a depth of <0.2 mm, and 0.1 mL of antigen injected until a 5 mm pea-sized bleb was produced. After 48 h, subjects returned to the lab, and the DTH response at each test site measured. The extent of the induration response was palpated at the reaction area (manifested as firmness and redness), outlined with a black-ink ballpoint pen, and then removed with scotch tape prior to mounting on the skin test record form. The tape impress for each induration was measured across two diameters and averaged. Plasma samples were collected one month before and one month after the children were administered a single 0.5 mL dose of PNEUMOVAX 23 intramuscularly (deltoid muscle) (Merck & Co., Inc., West Point, PA). The plasma samples were assayed for specific IgG antibodies against Pneumococcal Capsular Polysaccharide (PCP) (BINDAZYME™ Anti-PCP IgG Enzyme Immunoassay Kit, MK012, The Binding Site LTD, Birmingham, England). The measuring range of the assay for anti-PCP IgG antibodies levels is 3.3-270 mg/l, with an intra-assay precision of 3.1-5.9% CV and an analytical sensitivity of 0.62 mg/l. Subjects with parental assistance recorded URTI symptoms on a daily basis in a log using numbered codes. The following health problems were recorded, in accordance with previous investigations by our research team : 1) No health problems; 2) Cold symptoms (runny, stuffy nose, sore throat, coughing, sneezing, colored discharge); 3) Flu symptoms (fever, headache, general aches and pains, fatigue and weakness, chest discomfort, cough); 4) Nausea, vomiting, and/or diarrhea; 5. Muscle, joint, or bone problems/injury; 6) Other health problems. An URTI episode was recorded if cold (#2 item) or flu (#3) symptoms persisted for two days or longer. The primary outcome reported in this study is the total days with URTI symptoms. URTI severity and duration per episode were not monitored or calculated in this study. Data are reported as mean ± SD, and were analyzed using SPSS 11.5 (SPSS Inc., Chicago, IL). The dietary intake data were analyzed using 3 (groups) × 3 (times of measurement) repeated measures ANOVA, with immune data analyzed using a 3 × 2 repeated measures MANOVA. When Box's M suggested a violation of homoscedasticity assumption in MANOVA, Pillais trace statistic was used as the test statistic because it has been shown to be robust against departures from covariance equality. If the group × time interaction P value was ≤ 0.05, a change variable was calculated and compared between groups using Bonferroni adjusted Student's t-tests. URTI data from the daily logs were combined into group averages and the total number of sick days recorded was compared between groups using oneway ANOVA. Chi-square analysis was used to compare the number of children across groups who reported at least one URTI episode during the study period. Power analysis was performed after the study was conducted using the fpower macro in SAS (SAS Institute, Inc., Cary, NC), and revealed that 41 to 142 subjects would be needed (depending on the immune measure) to achieve 80% power. The power analysis is a conservative estimate and was conducted a posteriori because data on children for all of the immune measures used in this study were not available prior to the study. We acknowledge that the sample size is considered marginal for this study, but subjects were well randomized, and the results are in accordance with what we and other have observed in adults. Seventy-three children (55% male, 45% female) started the study, and 65 adhered to all aspects of the study design and were included in the statistical analysis. Groups did not differ significantly in subject characteristics, and data are provided in Table 1 for all 65 subjects completing the study. Subjects consumed an average of 3337 ± 851 g cereal during the two month study, and this quantity did not vary significantly between groups. Nutrient intake (combining self-selected diet and fortified cereal) is summarized in Table 2 for each group. 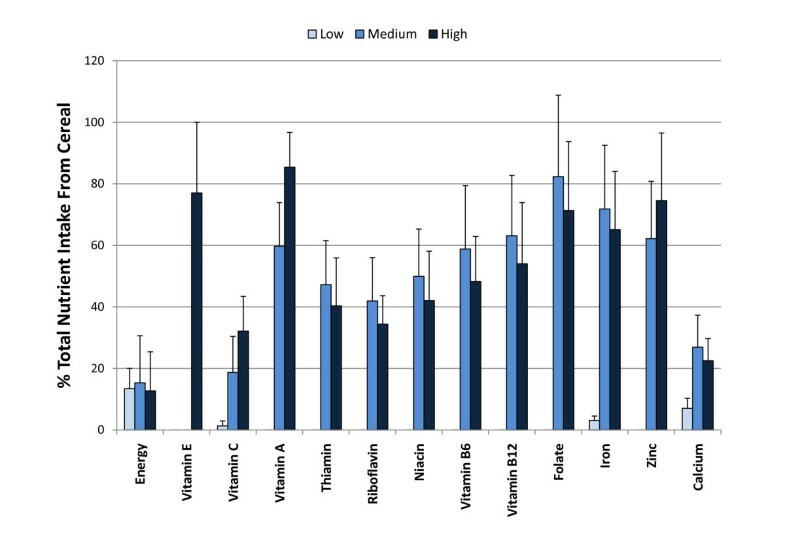 In comparison to the low group, intake of B-complex vitamins, vitamin A, zinc, and iron was elevated in the medium and high groups at 1- and 2-months, with vitamins E and C elevated in the high group. Figure 1 depicts the percentage contribution of the fortified cereal to total nutrient intake. The cereal supplement represented 13.4 ± 6.6, 15.3 ± 4.3, and 12.7 ± 2.9% of total energy intake during the study period for low, medium, and high groups, respectively, and contributed ~20% to 85% of the nutrients listed. * For subjects adhering to all aspects of the 2-month research project. Data represent mean values of pre- and post-study measures. * = p < 0.05 compared to the low fortification group. The percentage contribution of the fortified cereal to total nutrient intake after one and two months supplementation. The mean total number of days with URTI during the study period did not differ significantly between groups, and subjects averaged 8.8 ± 10.9, 10.4 ± 6.5, and 7.4 ± 7.2 days with URTI for low, medium, and high groups, respectively (p = 0.556). The percentage of children reporting at least one URTI episode during the study period did not differ between groups: 83%, 90%, and 74% for low, medium, and high groups, respectively (χ2 = 1.78, P = 0.411). The pattern of change in leukocyte subset counts did not vary significantly between groups (data not shown). Pre- to post-study changes in natural killer cell function (Table 3), granulocyte phagocytosis and oxidative burst activity (Table 4), salivary IgA concentration and secretion rate (Table 5), the global IgG response to pneumococcal vaccination (Figure 2), and DTH response (Table 6) did not differ significantly between groups. * Low (N = 24), medium (N = 21), high (N = 18) level of nutrient fortification of the cereal product. Mean ±SD. E:T = effector-to-target ratio. * Low (N = 23), medium (N = 20), high (N = 19) = level of nutrient fortification of the cereal product. DCF = dichlorofluorescein; FITC = fluorescein isothiocyanate. * Low (N = 21), medium (N = 24), high (N = 19) = level of nutrient fortification of the cereal product. The 4-week global IgG response to pneumococcal vaccination did not differ between supplementation groups (interaction effect, p = 0.7862). * DTH skin response represents the sum of three skin tests: tetanus, mumps, and candin. Low (N = 21), medium (N = 21), high (N = 19) = level of nutrient fortification of the cereal product. Despite significant improvements in dietary intake of immune-related nutrients through ingestion of a fortified cereal (~60 g/day) during a 2-month winter period, URTI rates and pre- to- post-study changes in all immune function measures did not differ between groups. These data do not support the use of micronutrient fortified breakfast cereals by healthy, growing children for the purpose of augmenting innate or adaptive immune function and lowering URTI risk. Although dietary nutrients are important for immunocompetence in all humans , related benefits from micronutrient supplements are most often reported in populations with immune dysreglation such as malnourished children, the frail elderly, diseased individuals, and surgical or trauma patients [5–13]. Among healthy adults, immune function remains robust over a wide range of diet quality and nutrient intake, and adding supplemental nutrients beyond what is obtained in the traditional food supply has little if any discernable influence on immunity and infection rates [14–22]. In a double-blinded, randomized, placebo-controlled study of 138 healthy adults aged 40-80 years, Wolvers et al. reported no effect of 10-weeks supplementation with a micronutrient mix (vitamins E and C, β-carotene, and zinc) on a range of immunological measures including the antibody response to vaccination, phagocytosis and oxidative burst activity, and lymphocyte proliferation. An enhanced DTH response was reported, but this benefit was limited to the older subjects, similar to data previously reported by Bogden et al. . Other studies of healthy adults with uncompromised immune systems using single-nutrient supplements such as zinc, selenium, or vitamin E have also reported negligible immune benefits, although tocotrienol supplementation may improve the immune response to a vaccine challenge [19–24, 38]. To our knowledge, our study is the first to investigate the influence of micronutrient supplementation through breakfast cereal fortification on immune function and URTI in healthy, school-aged youth. Kutukculer et al. studied the effect of acute, large dose vitamin A and E supplementation on the IgG response to tetanus toxoid immunization in healthy infants, and reported no supplementation effect on the antibody response. Several other studies have reported positive immunological responses and reductions in acute lower respiratory infection and diarrhea to nutrient supplementation in malnourished or infected young children [25–31]. Thus the limited data available on the relationship between micronutrient intake and supplementation on immune function in children is consistent with data collected in adult populations: supplemental micronutrients are efficacious among those suffering from syndromes related to immune dysfunction but unlikely to augment immune function or decrease infection risk among well nourished and healthy individuals. Among our "medium" and "high" supplement groups, ingestion of the fortified breakfast cereal represented ~20-85% of total dietary intake for zinc, iron, vitamin B6, folate (and other B complex vitamins), and antioxidant vitamins. Supplemental capsules containing a micronutrient mixture would have provided a greater quantity, but this study was designed to test the utility and efficacy of using a fortified breakfast cereal delivery system. The volume of breakfast cereal consumed per day by our young subjects (mean of ~60 g or 2.7 cups) over a two month period approached the maximum amount they could tolerate. For the five key immune-related nutrients in the "high" fortification group--vitamins A, C, and E, zinc, iron--supplementation with the fortified cereal product by the children during the study provided approximately 30% of the U.S. Daily Value above typical food intake. Thus at the nutrient density used in this study, the strategy of using fortified breakfast cereal to improve immune function and lower URTI risk in healthy children is not recommended. In conclusion, our hypothesis of URTI incidence reduction and immune modulation in healthy, school-aged children through ingestion of a breakfast cereal fortified with immune-related nutrients was not supported. We measured URTI rates and conducted a variety of in vitro and in vivo measures of both innate and adaptive immune function, and failed to find any significant group differences during a 2-month winter period. Thus within the context of this investigation, our data do not support the use of immune benefit claims for healthy, school-aged children from ingestion of fortified breakfast cereal. Supported by a grant from the General Mills Bell Institute of Health and Nutrition, Minneapolis, MN. The authors have no conflicts of interest.